In the mid-1970s the illustrious Ivan Illich, Austrian philosopher and critic of Western culture, calculated the average speed of a car to be 3.7 miles per hour, about the speed of a brisk walk. 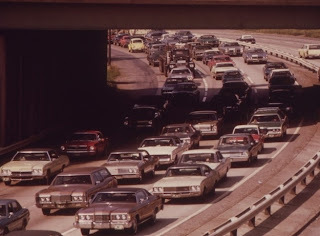 Illich arrived at this shocking number by dividing the average annual miles per car driven in the US in 1974, approximately 6000 miles, by 1600 hours, which represents the total of time required to make the car go that far. Those hours include the actual time spent actually driving it, the time spent pumping the oil and refining it into gasoline, the time spent by health care professionals on the consequences of traffic accidents, and so on. You might think that this falls firmly in the category of "Lies, d--n lies, and statistics". But Illich used this to illustrate the concept of counterproductivity. I would like to update the result for the early 2010s. However, I think it is excessive to include such things as the time spent on producing oil and refining it into gasoline: after all, that can be counted towards time that someone else spends on their job. So in my analysis I am going to count only the amount of time actually spent driving the car, plus the time required to make enough money to own and operate the car. I like to keep things simple, so I leave out the time spent for repairs at the garage, time spent at the hospital after any accidents, time cleaning the car, and so on. NPR reports that the average price of a car in 2012 is right around $30,000. Let us consider the popular Toyota Highlander SUV as a typical car in that price range. The base MSRP is $ 28,870, and the total cash price including taxes and such, as reported by Edmund's (for ownership in Cambridge, MA) is $ 29,067, a little less than the average car price of $30,000. The good people at Edmund's have also calculated that the True Cost to Own this car for 5 years is $ 48,046. That includes financing over 60 months, taxes, fuel, maintenance, insurance trade-in value at the end of the 5 years: everything. They assume you drive 15,000 miles per year, not that different from the 13,500 mile average reported by the Federal Highway Administration for 2011. The US median income was $ 50,000 for 2011 ("median" means that half the Americans made more than this, and half less). Total income taxes for this middle income segment was approximately 25%, so the median take-home pay after taxes is $ 37,500. Assuming a 40-hour week and two weeks vacation for the year, the after-tax pay amounts to $18.75 per hour. So someone with the median income would have to work $ 48,046 / $ 18.75 per hour = 2562 hours in order to own and operate a typical average car like the Toyota Highlander. 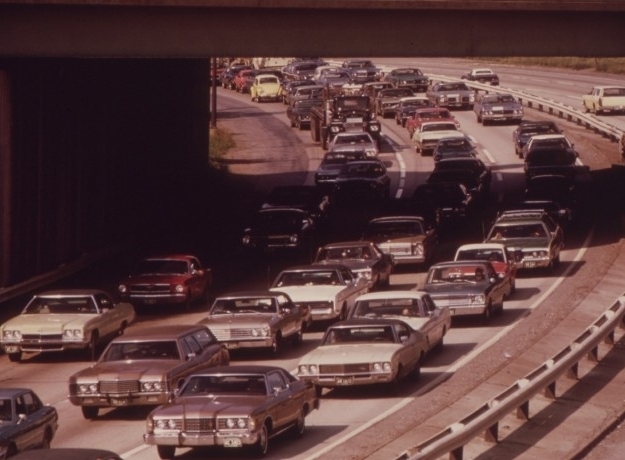 Currently, Americans spend 540 hours per year driving our cars, or 2700 hours in five years. So in total we devote 2700 + 2562 = 5262 hours to drive our car for five years. During those five years we cover 5 x 13,500 = 67,500 miles. Dividing that by 5262 hours we arrive at the average speed of the average car driven by the American with the median income: (DRUM ROLL....) 13 miles per hour. That's on the low end of typical bike speeds, 10-20 mph. Put another way: we spend 20 hours every week either actually driving, or working so we can afford to drive. This is the average for the overwhelming majority of us, who don't even drive for a living like truck or taxi drivers do. You wonder if we wouldn't be better off spending that time biking. We would be healthier. We would keep the air cleaner. And we would slash our carbon footprint by 25%, making the planet healthier. I prefer both when traveling. I use my bike when I think traffic will be hampering my sched for hours since, my workplace isn't that far from my home. And I'm using my car during long trips with my family. It's wonderful to live within biking distance from work! I love the way you reserve the car for what it's meant for: to share, on long-distance travel. I bet you're in great shape! So that’s how you analyze the average speed of the average car..I just do wonder if you can also present a study regarding the average speed of an average motorcycle. A Harley costs around $15,000. A Vespa scooter is in the range $5,000. A nice bike like the aluminum-frame Canondale starts around $700. Do the math: you will find that as you go towards the bicycle your average speed gets close to your actual speed. But the bicycle is the only one that also gives you cardiovascular benefits, gratis and for free! Well, we might not be able to totally dispense of the car, but we definitely need to put more emphasis on riding or walking when taking the shorter path. Uh, bogus! You didn't apply the same standards to bikes. Bike ownership in place of a car incures more expenses when you can't drive someplace, like across the state to visit a relative, or a family vacation in a national park. Bikes can't use freeways, so they require longer distances to get from A to B, which takes more time traveling and less time "earning". When you boil a bike speed down by the time spend accommodating that lifestyle (the same as you did with the car analysis) you might find walking has a higher average speed than bikes. Sure, bikes are not great for long distances. On the other hand, inside cities bikes are often faster than cars, especially the well-designed cities. They are certainly cheaper, and friendlier to the climate. And most of the world's population will live in cities soon. As for long distance travel, most places outside the US already have great rail and bus connection. Stop the Smog: use cleaner coal and diesel.